To play business golf you need a basic understanding of the game of golf. 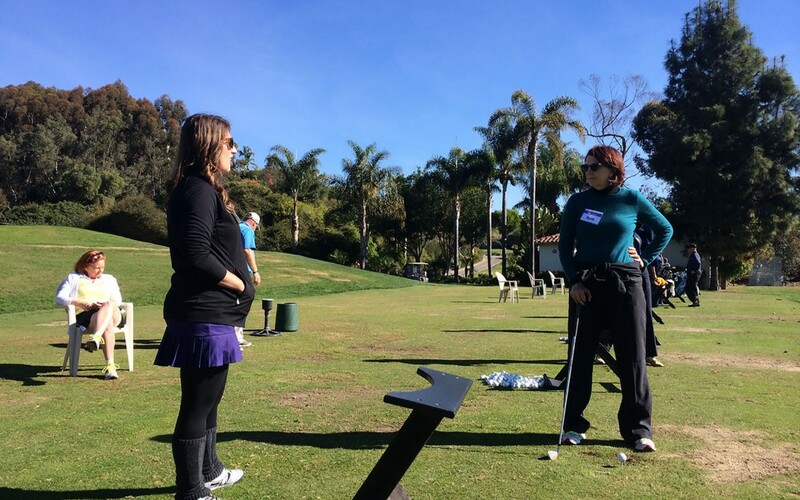 The best way to start is by learning the purpose of the game (how a person would essentially shoot par, the intended number of strokes to get through the whole course.) After you understand the game, then you will be ready to learn what the different clubs in a typical golf set do and how to use them. Golf is a game/sport that involves a tiny white ball, 14 clubs, 7 miles of land with a bunch of hazards and obstacles with the sole intention of getting that tiny white ball into a 4.25 inch hole hundreds of yards away and if that isn’t hard enough; we don’t just do it once we do it 18 times. What’s even crazier is that people of almost any age can play it. And that is what makes this game so great for families and for business. Where and how golf originated is uncertain but it is a toss up between the Dutch and the Scottish in the 13th and 14th centuries. What’s funny is that it was traditionally a sport played when trade routes were stalled due to inclement weather. There isn’t any proof but I bet that’s when business golf originated! Before we get into what each club does and the strategy of playing golf, I want to debunk a myth real quick. We all have heard it over the years and I’m tired of listening to both men and women tell me, “you know what GOLF stands for don’t you? Gentleman Only Ladies Forbidden?” This is not what Golf stands for and its just something a guy who couldn’t handle women in his boys only club probably made up. So let’s work together to stop the rumor! The ultimate goal in golf is to get the lowest score possible on 18 holes. The par of the hole is the ideal number of strokes you want to have for that hole and is based on hole lengths ranging between 75-550 yards. Par 3’s range from 75-170 yards from the red tees, Par 4’s range from 275-400 yards and Par 5’s range from 400-550 yards. These lengths are determined by the number of shots it should take to get on the green plus 2 strokes to get into the hole. For example on a par 3 it should only take you one shot to get on the green and 2 putts to get it into the hole for a score of 3. [Figure 1] On each hole there are hazards (sand traps, lakes, rivers, marshes, out of bounds), fairways, the rough, and the green. These make it more difficult to make par but also make for beautiful landscapes and views. Everyone who plays golf competitively wants to shoot a 72 but for most people that never happens so I wouldn’t worry too much if you find yourself shooting a 144 the first few times around. To put score in perspective lets look at some averages. Solutions report stated that the average score for all golfers is 100. Men playing on an 18-hole course shoot an average of 97 and the average for women is 114. If you regularly break 80, you’re in an elite class. Only 6 percent of men and 1 percent of women can make that claim. As you can see its not that easy to shoot 72 and that might be the reason why Tiger and Phil are making millions of dollars for being the best at what they do. But its also the reason why women starting out to play golf don’t have to be as good as they think they need to be at the sport. You just need to be good enough (hit the ball in the air 50% of the time, know the rules and etiquette, and be able to have fun).